Twitter today reported Q2 earnings, and the woe that is its poor user growth continues, with its 313 million monthly active users up just 3% on a year ago, and up less than 1% on its previous quarter. The company reported revenues of $602 million with adjusted earnings per share of $0.13. While revenues are up 20% on a year ago, the numbers were a miss on sales and a beat on EPS: analysts were expecting $606.8 million in revenue and adjusted earnings of $0.10 per share. It also reported a Q2 GAAP net loss of $107 million; non-GAAP net income was $93 million. And Twitter has also published Q3 guidance that also does not speak of big growth ahead: it expects revenues in the range of $590 million and $610 million. The market is not happy with the numbers: the stock is now down 10% in after-hours trading. Last quarter, the company reported revenues of $595 million with 310 million MAUs and weak guidance. In other words, sequentially, user growth in terms of MAUs was just under 1%. 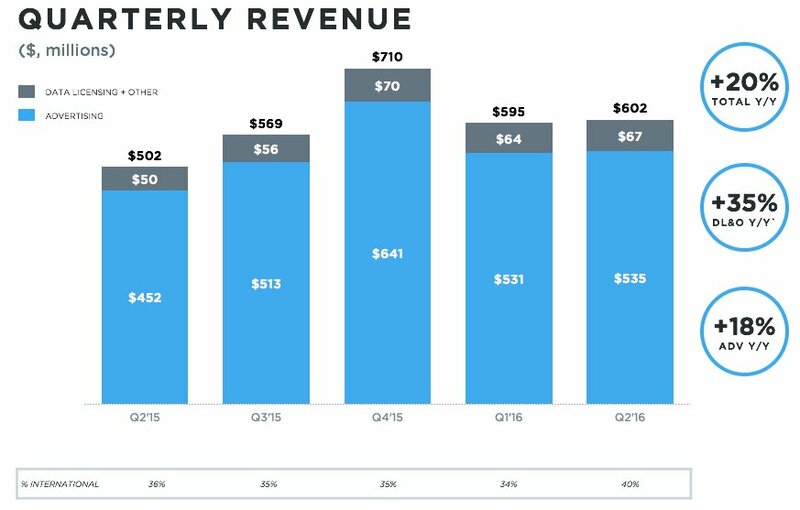 This graphic provided by Twitter clearly illustrates the problem: the company — despite its various efforts — has hardly moved in the last quarter, and excepting Q4 has had nearly identical quarters for the last year. Advertising revenue totalled $535 million, an increase of 18% year-over-year, Twitter said. Mobile advertising revenue continues to lead the way, accounting for 89% of total advertising revenue. Mobile was also 82% of total MAUs. While growth was not great overall, in the U.S. it was especially bad: U.S. MAUs were 66 million for Q2, Twitter said, up a mere 1% year-over-year and up only 1 million on the 65 million of the previous quarter. Internationally, things were slightly better, with MAUs of 247 million for Q2, up 4% year-over-year and up 2 million on the 245 million of Q1. The issue is that generally speaking, if you compare Twitter to other social platforms like Facebook that pick up users abroad to offset some saturation in its home market, international and developing markets should be a much bigger growth engine for Twitter than it is. Twitter has consistently disappointed the market with its poor user growth, which all but stalled earlier this year. Yesterday, the company seemed to be trying to head off today’s news at the pass by announcing yet another marketing effort to better explain the company and what it’s purpose is for the world at large. He also noted five priorities for the year: “refining our core service, live-streaming video, creators and influencers, safety, and developers,” and the company believes it has made “meaningful progress” across each of these in the past quarter. There certainly have been some changes: Twitter has tweaked its basic format by instituting algorithmic changes in the timeline to surface more “sticky” Tweets rather than chronological Tweets; and it has contemplated ways of extending its 140-character limit: these are examples of how the company has tried to address some of the complaints. The company has also been making a big effort to sign a lot of content deals, specifically around sports, to stream events live on its own platform. It’s still very early days, and one initial effort covering Wimbledon was nearly impossible to find on the site, but it’s an interesting turn for a company that had up until now positioned itself as a place to share links to things, not consume things directly. Whether it works to keep people around for longer is the big question. And it’s trying to make more headway into new areas like the currently trendy area of VR and AR, such as with its recent acquisition of Magic Pony Technologies. But the challenges remain. One of the biggies that we’ll be listening for on the call is whether the issue of harassment comes up at all. The company is still working through ways of dealing with so-called trolls who bully others on the platform, trying to walk the fine line between the free speech that Twitter in theory celebrates, and shutting down bad actors.